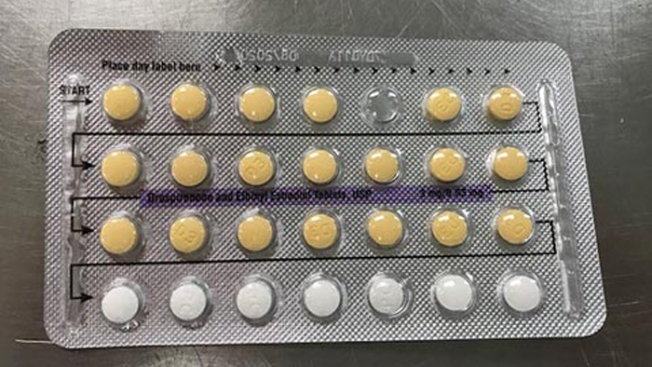 Thousands of drospirenone and ethinyl estradiol birth control packages are being recalled over a "packaging error" that could have women taking pills off the medication's schedule. The Apotex Corp. recall covers 3 mg / 0.03 mg drospirenone and ethinyl estradiol tablets that feature the NDC number 60505-4183-3 on the outer and inner cartons. The packaging may have an incorrect tablet arrangement or an empty slot for a tablet, meaning a patient may take the wrong pill, varying the dosage. Apotex said in its recall notice that it's received no reports of pregnancies or adverse events due to the issue. Anyone with affected tablets should speak with their pharmacy and health care provider; they should also continue their therapy or use a non-hormonal method of birth control, according to the recall notice. "As a result of this packaging error, where a patient does not take a tablet due to a missing tablet or that a patient takes a placebo instead of an active tablet, loss of efficacy is possible due to variation in the dosage consumed," Apotex said in a statement. The affected pills were distributed to wholesalers and distributors nationwide, according to the recall notice. The affected lot numbers are 7DY008A	through 7DY011A, with expiration date 8/2020. A representative for Apotex said that 82,705 packages are being recalled. Any consumers with questions can reach Apotex by calling 1-800-706-5575 between 8:30 a.m. and 5 p.m. on weekdays or by emailing UScustomerservice@Apotex.com.